With so many sizes and styles of faucets on the market today, it can be difficult to figure out which one to get. Here are some things to consider before you make your purchase so that you make the most of your purchase. 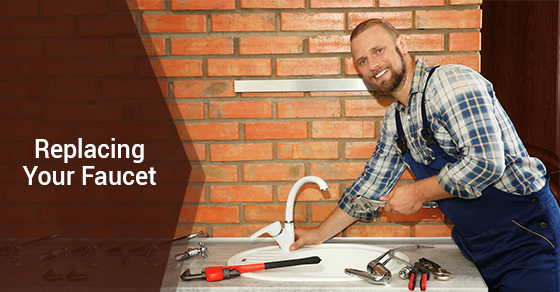 In some cases, your faucet may simply need to be repaired – in fact, it may not need to be replaced at all. However, if your sink is constantly leaking, or you have an older faucet, it is likely time to simply replace the faucet altogether. Ensure that the spout height and reach make sense; for example, does the faucet fit? If you have multiple sinks, does the hose extend to all sinks? Next, consider its valves: in order to avoid a leaky faucet, choose one with ceramic valves. Don’t forget to count the number of faucet holes in your sink if you plan on having one handle instead of two. Faucets are among the most used items in your home – convenience is key. Consider that single handles are typically more convenient. Similarly, think about who will be using the faucet – for example, single handles are easier for children. If you cook a lot, you might choose one that has a lever. Handles that are tall and curved are also ideal for the kitchen. Touchless electronic faucets are not only convenient but also more environmentally friendly because they turn off as soon as you move your hands away from them. Mostly everyone in the industry will agree that pull-down sprayers are more reliable than sidespray faucets. In terms of finishes, choose one that matches your current hardware. Keep in mind that chrome will last the longest while also being the easiest to maintain. Nickel finishes (i.e., those that are brushed) and stainless steel are also long-lasting but can be prone to smudges. Most plumbers and other people in the industry will recommend that you spend roughly $65 dollars on a bath faucet and $100 on a kitchen faucet in order to ensure that you are making a high-quality purchase. Of course, spending more than this will mean that you are paying for additional features that you likely don’t need. When it comes to installing a new faucet, professional installation will ensure that you get the best results. Contact our team of experts at Brothers Plumbing today. We have over 50 years in the industry and offer affordable rates.